If you are planning to visit Europe these days or actually live here… get ready for some very cold weather and temperatures much lower than normal. -37 degrees Celsius is not a temperature to be enjoyed and we have it here in Czech Republic. Well not everywhere – just in the mountains - but even the -20 we are likely to have tomorrow in Prague is calling for some extra defensive measures: Stay at home. Keep warm. Sip mulled wine. Read a good book. Watch the TV - or - get on the internet to chat, browse, and socialize. 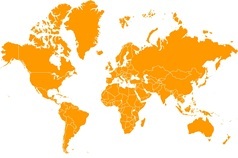 VIDEO: here is a recent map of the global avast! presence. Pretty good coverage.